Vinita, of Surf City Pier, reports a “mixed bag” of fish. Flounder, blues, pompano, Virginia mullet, and red drum have all been biting, while a good number of kings have also recently shown up. Spots are inconsistent, but they’re definitely out there. 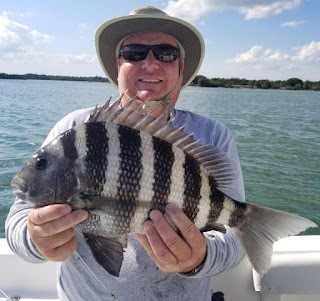 Michael Nichols, of Wilkesboro, NC, with a 19” sheepshead landed using live shrimp near Brown’s Inlet. 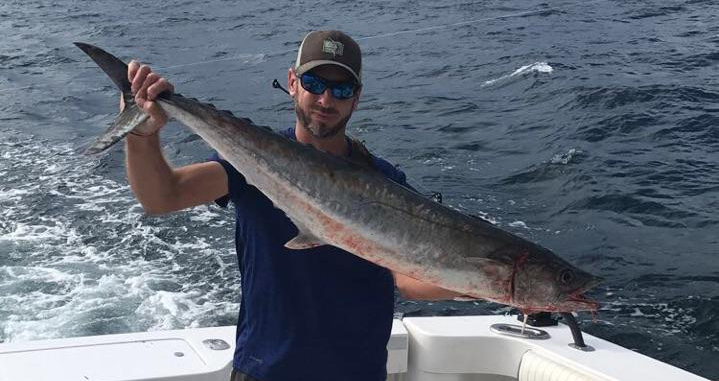 Daniel, of Seaview Fishing Pier, reports that after a great spot run last week, the action has slowed down a bit. Overall, the catch has mainly consisted of Virginia mullet, bluefish, and some good-sized spanish and pompano. The pompano have been falling for shrimp, and the spanish are hitting Gotcha plugs. One or two decent kings have also been pulled in, with live bluefish as the bait. Robbie, of Jolly Roger Pier, reports a recent surge of pompano that are biting bloodworms and shrimp. In addition, there have been a few spanish, blues, black drum, and Virginia mullet. See the full report at Fisherman's Post. Looks like a successful trip with a good variety of fish. Are you finding that livebait is working best for Kings at the moment?